Why buy a vintage pen instead of a modern pen? Your miles will vary when you buy a fountain pen, just as it does with almost every other item you can purchase. However, vintage pens offer features that are hard to find on modern pens. They also may require more care and upkeep than their modern counterparts. A lot of vintage pens were often made with hard rubber or celluloid, and they are usually quite beautiful. Many have solid 14KT gold nibs, many are flexible, and each pen carries its own unique history. They also have different filling systems – you’ll more often see eyedroppers, lever-fillers, crescent-fillers, and more. 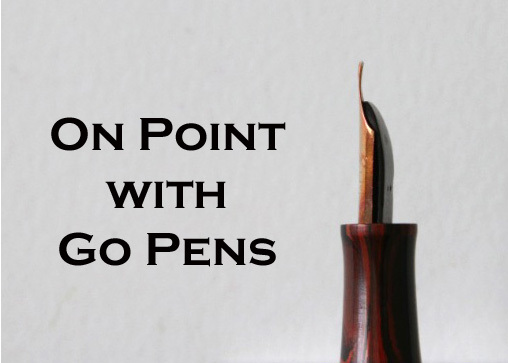 People are usually interested in either collecting vintage pens because they have an interest in a brand or model, or they are interested in vintage pens because of the flexible nibs. If you are interested in adding character to your handwriting, a vintage flexible nib pen is something to consider. As mentioned, they require more care and upkeep. Sometimes they will need restoration, sacs will need replacing, previous owners may not have cleaned them before storing them so there may be dried out ink in the feeds and sacs, and the bodies may need attention (if there are cracks or discoloration, for example). The unique history and beauty of a vintage pen can be very appealing to many people, but they may not be for everyone. Have a look at our Catalogs and see if any of the pens stand out to you!